2. Cable wiring is completed, can not use the DB9 line of renovation works. If you have any questions about debugging, please contact us for technical services. 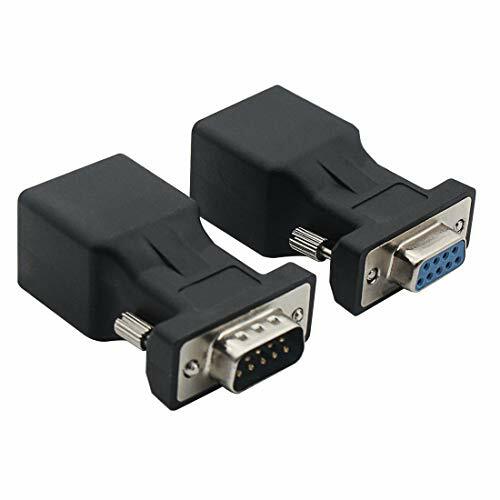 DB9 (RS232) male to RJ45 adapter for TCP/IP network interface with the double-way conversion,Transmit signals between your VGA video ports over CATS, CAT5E, and CAT5 CAT6 RJ45 network cables. ABS&Metal Material, Slim profile reduces bending and provides a secure connection.Nick-plated and Oxygen-free copper transmission port on the port minimize crosstalk, suppress noise, and protect against electromagnetic interference (EMI) and radio frequency interference (RFI),Premium adapter engineered with molded strain relief connectors for durability, grip treads for easy plugging and unplugging, and finger-tightened screws for a secure connection. High speed and safety data transfer,Double-shielded standard to ensure that signal transmission without interference,Transmits signals up to 100 FT. Wide application,PC,laptop,Computer,DVR,media center,game consoles etc.Connect your personal media devices to a larger system, such as a monitor, for the ultimate viewing experience. All our product are under strictly tested by us,we promise,quality guarantee and 5-star customer service. If you are not 100% completely satisfied with your adapter, simply let us know and you will be offered a FULL refund or replacement. If you have any questions about this product by YIOVVOM, contact us by completing and submitting the form below. If you are looking for a specif part number, please include it with your message.